As the semester is coming to a close, things are getting pretty crazy on campus. 25 days to Graduation, 16 days until move-out, 12 days to finals, and 10 days until the Silver Needle Fashion Show! Yes, the fashion show is coming up quickly and as a member of the fashion department, I am very excited! My “craziness” is centered around one event: this year’s fashion show. One of the unique things about this event is that it is completely student run. Yes, there is a class at Marist that plans the entire fashion show. It does not matter what grade level you are, any fashion major or minor is welcome to apply for a role in the class. Even if you are not in fashion, there are numerous opportunities for students to get involved. The fashion department auditions models at the beginning of the year to be used for freshmen, sophomore, and junior designs. They also have sign-ups for dressers and raffle and usher volunteers at the beginning of the spring semester. If none of those rolls interest you, there are even more opportunities to get involved! There are so many different aspects that go into this one show that no matter what your major or grade level is, you can be involved. As a member of the Fashion Show Production Class, I have been a part of the thought process behind the branding of Marist Fashion and the decisions that have been made every step of the way for the fashion show: from accessory organizers to the banners and décor. Within the class, there are three teams: Communications, Production, and Creative. Each team consists of two sub-teams; I am a part of the Creative Team as a Script & Soundtrack Coordinator. Everything that you hear, whether it be during the cocktail hour, during a video, or on the runway, I have worked on. It is an exciting experience that I am lucky enough to learn from. As a Script & Soundtrack Coordinator, I have conquered a lot of new experiences. With the assistance of the Media Center faculty, I helped organize, film, and edit my first (and second) video; I attended my first ever photo shoot and will soon attend my very first fashion show. Through Marist and the Fashion Department, I have been able to challenge myself and step outside my comfort zone. Even as a freshman, I have been able to get the hands-on learning experience necessary for going into the industry. I can honestly say that I cannot wait until the fashion show! Buy Tickets for the show here. 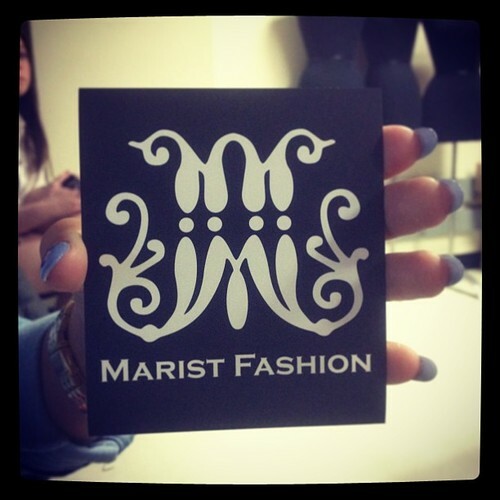 Make sure to follow the Marist Fashion Twitter account. Like the Marist Fashion Program’s Facebook. And don’t forget about their Tumblr for some cool pics and videos.